Hiroki Sugihara, the son of a Japanese diplomat posted to Lithuania in 1940, tells how his father suddenly found himself confronted with a terrible dilemma. Hundreds of Jewish refugees, driven out of Poland by the Nazis after they had invaded and then occupied that country, began to show up at the gates of the Sugihara home, which doubled as the Japanese embassy. The Sugihara’s, Hiroki, his younger brothers Chiaki and Haruki, his Auntie Setsuko, and his parents lived upstairs, and his father, Chiune Sugihara, worked downstairs. Men, women and children, dressed in layers of clothing despite the July heat, were seeking visas that would enable them to travel through Russia to find asylum in Japan. Sugihara knew he had to do something, so he asked the crowd to choose five people to come inside and talk with him. The next day, Sugihara cabled the Japanese government asking if he might be allowed to issue visas to the desperate refugees. His country refused his request, leaving Sugihara with a tough moral decision – turn away the people outside his gate and leave them to certain death at the hands of the Nazis or disobey his government. Sugihara chose to issue visas to each and every person outside his gates, disregarding Japan’s order. 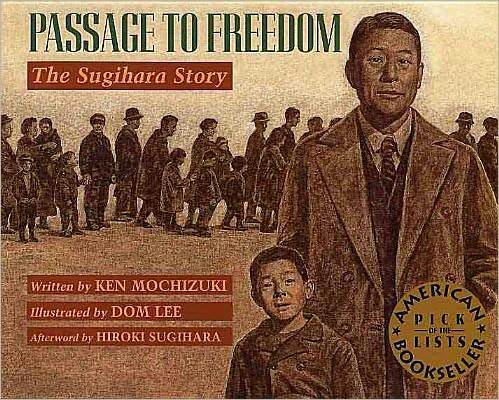 Day after day, from early morning to late in the evening, Sugihara hand wrote about 300 visas per day. Even after the Nazis and Soviets began to close in on Lithuania, visas were written, right up until the family was ordered by Japan to leave when Sugihara was reassigned to Berlin. In telling his father’s story, Hiroki writes in the Afterward that it is a story that he believes “will inspire [readers] to care for all people and to respect life. It is a story that proves that one person can make a difference.” His father remained a diplomat for many years after the war, eventually leaving the Foreign Service. In the 1960s, Chiune Sugihara began to hear from some of the people to whom he had given visas, and who referred to themselves a Sugihara survivors. He ultimately received the Righteous Among Nations award from Yad Vashem in Israel. Dom Lee’s sepia-toned illustrations provide close detail and give a feeling of dimension and authenticity to the story being told, seemingly based on old photographs of the July 1940 events. They are done by an very unusual method. Lee applied encaustic beeswax to paper, scratched out the image he wanted and then added oil paint and colored pencil. Passage to Freedom is indeed an inspiring story and one that should be shared with young readers. Sugihara was a real hero, a man who put human life above politics, even at a time when Japan was at war with China and relations were already contentious with Great Britain and the United States. One thing that did amaze me was that his government didn’t call him back to Japan to censure him. An extensive PDF Classroom Guide for Passage to Freedom is available from the publisher, Lee & Low books. I had never heard this story and now am burning to read. Thank you for sharing this.